Kharkiv, with its broad streets and impressive appearance, has a solid attitude towards reforms: they mean that they expect reforms to take effect, better sooner than later. “There is no time left; just like the current military situation in neighboring Donbass, no excuses should be made. The reforms in the Civil Security Sector must continue. Otherwise Kharkiv Region might face new challenges in the future which will be difficult to overcome”, said the Head of Kharkiv Regional Administration, Ihor Rainin, when meeting the EUAM delegation. There are 300.000 internally displaced persons in the region, originating from the conflict. A number, which can be compared with the population of the city of Poltava in Central Ukraine. Managing this new reality and keeping public order is not the only challenge for the oblast (region) of Kharkiv, although situated several hundred kilometers away from the battle fields. Kharkiv is about to allow for the re-introduction of mass events in the streets of the city as well as football matches, while mobilizing all possible resources for secure public safety. 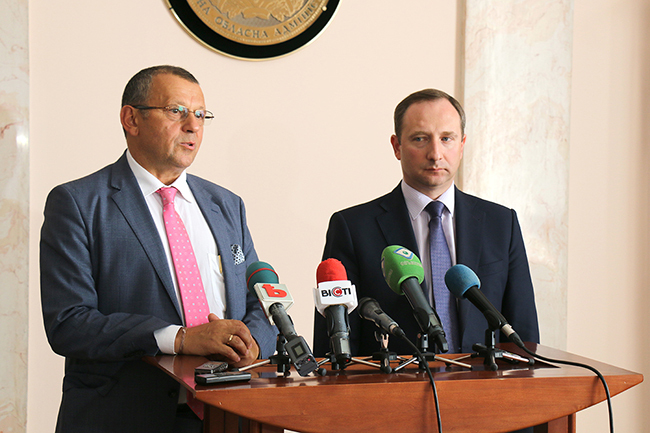 Kalman Mizsei and the Chairman of Kharkiv regional administration met for the first time. HoM Kalman Mizsei introduced the Enhanced Regional Outreach programme and outlined the main aim of the EUAM – to provide support for Civil Security Sector Reform throughout Ukraine. “Enhancing the regional outreach, the EUAM aims to understand better the needs of oblasts. We are here to assist you with the best European practices and advice, linking the reality to the central reforms, helping you to overcome the challenges”, said Kalman Mizsei. “The success of the project always depends on the joint efforts. You know your region like no one else, so make use of the European professionals who are ready to share their knowledge and experience”, added Udo Moeller, the Head of EUAM regional outreach. All of the participants at the meeting in the governor’s office — the Head of Kharkiv Regional Police, the Head of the Prosecutor’s Office, the Head of the Border Guard Service and the Head of the Security Services — emphasized the European choice for Kharkiv. They expressed strong appreciation for the work of civil society activists and the need to rebuild the trust of people. “EU has succeeded in civil security sector reform, and we are just on the way to take the first steps in this direction. But we are quick and persistent learners. Kharkiv region will definitely benefit from our cooperation with EUAM”, stated Ihor Rainin, and reiterated that he hopes to achieve the first visible results within the upcoming two months.